Hillary Clinton speaks to supporters during a campaign event on Sept. 18, 2015, in Portland. AUGUSTA, Maine — A Cuban-born sugar tycoon. A California-based registered foreign agent for the government of Sri Lanka. A Chicago billionaire. All of them are recent large donors to the Maine Democratic Party via a complex fundraising scheme called the Hillary Victory Fund. The fund exploits recent court decisions and weakened campaign finance laws to maximize political contributions and funnel them to the Democratic National Committee. Among contributors to the Maine Democratic Party via the Hillary Victory Fund is Chicago billionaire and Hyatt Hotel heir J.B. Pritzker, who gave $10,000 in September. His wife, Mary Kathryn, also gave $10,000. Alfonso Fanjul, the West Palm Beach sugar tycoon born in Cuba, gave $3,644 in October. Southern California entertainment magnate Haim Saban gave $10,000 to the party in November. His wife, Cheryl, gave $9,697 in October. And the Sri Lankan foreign agent, venture capitalist Imaad Zuberi, gave $3,081 the same month. 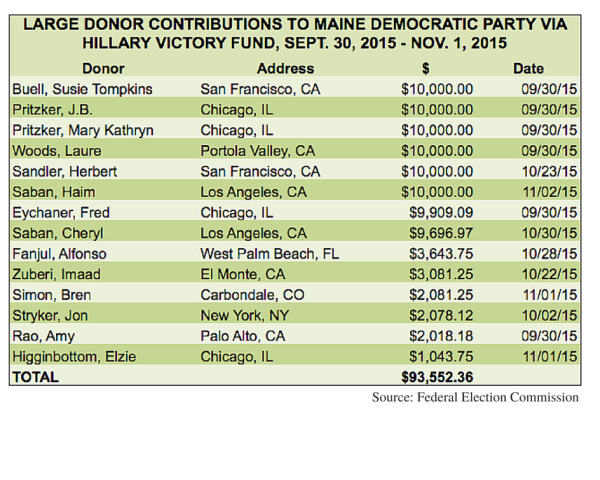 They’re among 14 out-of-state wealthy donors who gave $93,552 to the Maine Democratic Party since mid-September 2015. Six of the 14 donors gave $10,000 — the annual maximum for state party contributions from individuals — during the last three months. But all the contributions haven’t stayed in Maine, or any of the other state Democratic parties to which Hillary Victory Fund donations have been funneled. Federal Election Commission reports show that the two October and November transfers totaling $39,000 from the Hillary Victory Fund to the Maine Democratic Party each sat for less than 48 hours with the party before the exact same amounts were transferred to the Democratic National Committee, or DNC. While individual contributions to the state and national parties are capped, transfers between state and national committees are unlimited. That means that, effectively, donors can skirt contribution limits to the DNC or state parties by giving through joint fundraising committees like the Hillary Victory Fund. The contributions to Maine and other states have come after Congress and the Supreme Court, in its 2014 McCutcheon decision, weakened campaign finance restrictions that limited individuals to $123,000 in contributions over a two-year election cycle. Now that limit is $1.3 million over the election cycle. Those contributions are solicited through so-called “joint committee,” formed by candidates, the national party and in some cases, state parties. The committee can solicit one large contribution that is then divided among each of those entities. During the 2012 presidential campaign, both Barack Obama’s and Mitt Romney’s campaigns operated joint committees after they won their party’s nomination. But those were subject to the lower limits. In an unusual move, Hillary Clinton’s campaign formed the Hillary Victory Fund even before the Democratic Party nomination in the presidential race has been decided. The committee jointly fundraises for the DNC, the Hillary Clinton campaign and 33 state Democratic parties. 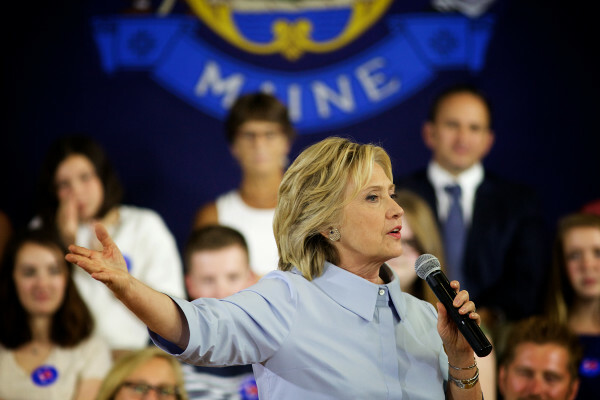 Kennedy, who worked on the Hillary Clinton presidential campaign in 2007-2008, said that working alongside the current Clinton campaign to maximize donations from wealthy patrons didn’t contradict the Maine party’s values. “From my standpoint we are always looking to enlarge our donor base and bringing more donors in to support our party,” said Kennedy. “It’s not giving more power to the individual to accept their donation, it’s spreading the power among more donors. Andrew Bossie, head of Maine Citizens for Clean Elections, said that the increased fundraising isn’t good for democracy. “Any time that a wealthy few … can contribute large amounts of money into the hands of parties, candidates, political groups, that comes at the expense of everyday people being able to have their voices heard,” said Bossie. Maine Republican Party Executive Director Jason Savage said that his group has “no concrete plans” to mount a joint fundraising effort at this point. “It’s not an appropriate thing to do at least until we have a nominee,” he said. But “we also haven’t done anything to rule that out” after a nominee is chosen. Bernie Sanders, Clinton’s chief rival for the Democratic nomination, also operates a joint fundraising committee with the Democratic National Committee, but that group has not raised money to benefit state party organizations. The Maine Center for Public Interest Reporting is a nonpartisan, nonprofit news service based in Augusta. Email: pinetreewatchdog@gmail.com. Web: www.pinetreewatchdog.org.